Google+ Reading Teen: THE GLITTERING COURT by Richelle Mead // Disappointment Is An Understatement.. THE GLITTERING COURT by Richelle Mead // Disappointment Is An Understatement.. I have never read a Richelle Mead book before so I was not sure what to expect. The premise sounded very interesting since it had a The Selection feel. OH man, was I wrong. To say I was disappointed by this book is an understatement. This book is the story of a girl born into privilege and when she became of age, she is forced into an arranged marriage to a man she has never met. In the hopes of escaping this fate, she makes a quick decision to change places with her maid and becomes Adeline, who is to be sent off for proper training in hopes of being a member of The Glitter Court. This Glittering Court offers a shot to become a part of society, a life they could only dream of, to a select group of girls. The new "Adeline" does everything she can to shine and stand out amongst the others trying to win the hand of wealthy suitors. No matter what, she cannot forget the one that has stolen her heart - Cedric Thorn. Cedric is not rich and he cannot provide Adeline with the life she has grown accustom to, but will she risk everything to be with him? I never understood the thought process behind the MC's desire to leave a life of luxury and arranged marriages, only to join another group of girls being groomed for a possible life of luxury and an arranged marriage. To me, that was just stupid. There is no character development at all. None. The MC started out as a spoiled brat and stayed that way. Plus the pacing of the story was dreadfully slow. I found my eyes glazing over throughout most of this book. This book is categorized as a "fantasy" book but there is absolutely no magic, no mythical creatures, no powers, nothing supernatural at all. The most "fantasy" this book gets is when Adeline finds Cedric performing a prayer. Who cares. This could (and probably should have been) categorized as a historical fiction novel. I was incredibly bored to tears with this story line itself. There was never any sense of danger or urgency anywhere to be found. It seems Mead had a hard time writing anything other than the descriptions of the dresses, foods, and locations. This story was powerfully tame. The romance was tame and the love interest was tame. And this is the first book in a new series by Mead? *ugh* No thanks, I'll continue to pass on her books. I absolutely cannot recommend this book to anyone. I know Mead is either you love her or you don't. Please note that I do not dislike her, only that I do not like or enjoy her books on any level. I did rate this book 2 stars and that is only because found myself enjoying the historical side of this story. 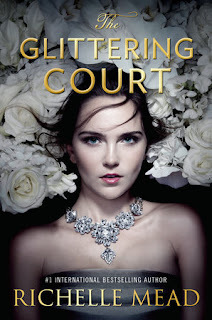 Be sure to stop by Tuesday to see what Becca thought of The Glittering Court, with a Review Rebuttle!